Cradlepoint provides wireless backup of wired Internet connections for small- medium business. In the event of an outage of the primary Internet land line (T1/fiber, DSL, or cable) at a site, Cradlepoint devices automatically switch to its wireless LTE broadband connection within 30 seconds. 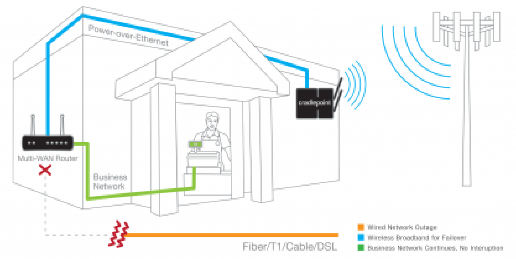 The point-of-sale (POS) systems connected to the Cradlepoint router continue to operate at broadband speeds without further interruption, ensuring continuous uptime for POS transactions. Many small- medium businesses rely on Cradlepoint technology for both primary and secondary (failover) connections. The former application is used when the pre- existing connection is spotty or slow in bandwidth. I.e. a T1 or DSL connection. In a failover environment, if and when a hard-wired connection goes down the Cradlepoint router takes over in less than 30 seconds on 4G/LTE or 3G, depending on your area. LTE coverage is widely available in the US. We stock routers that are approved for the major carriers, such as: Verizon Wireless, AT&T, Sprint, and International.